Peter was a tall figure, with an extremely striking build of 2.03 meters (6 feet 8 inches), and large, green eyes. suffered his first loss after Peter crushed a group of Swedish reinforcements marching from Riga. Deprived of this aid, Charles was forced to abandon his proposed march on Moscow. 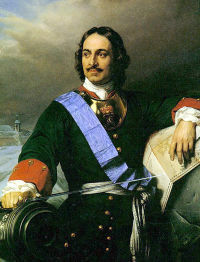 Charles XII refused to retreat to Poland or back to Sweden, instead invading Ukraine. Peter withdrew his army southward, destroying any property that could assist the Swedes along the way. Deprived of local supplies, the Swedish army was forced to halt its advance in the winter of 1708– 1709. In the summer of 1709, they nevertheless resumed their efforts to capture Ukraine, culminating in the Battle of Poltava on 27 June. The battle was a decisive defeat for Swedish forces, ending Charles' campaign in Ukraine and forcing him into exile in the Ottoman Empire. In Poland, August II was restored as King. Peter foolishly attacked the Ottomans in 1711. Normally, the Boyar Duma would have exercised power during his absence. Peter, however, mistrusted the Boyars; he abolished the Duma and created a Senate of ten members. 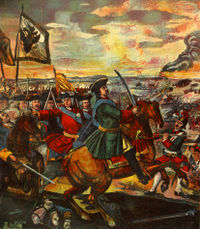 Peter's campaign in the Ottoman Empire was disastrous; in the ensuing peace treaty, Peter was forced to return the Black Sea ports he had seized in 1697. In return, the Sultan expelled Charles XII from his territory. Peter's northern armies took the Swedish province of Livonia (the northern half of modern Latvia, and the southern half of modern Estonia), driving the Swedes back into Finland. Most of Finland was occupied by the Russians in 1714. The Tsar's navy was so powerful that the Russians could penetrate Sweden. Peter also obtained the assistance of Hanover and the Kingdom of Prussia. Still, Charles refused to yield, and not until his death in battle in 1718 did peace become feasible. Sweden made peace with all powers but Russia by 1720. In 1721, the Treaty of Nystad ended what became known as the Great Northern War. Russia acquired Ingria, Estonia, Livonia and a substantial portion of Karelia. In turn, Russia paid two million Riksdaler and surrendered most of Finland. The Tsar was, however, permitted to retain some Finnish lands close to Saint Petersburg, which he had made his capital in 1712. Peter I's last years were marked by further reform in Russia. On 22 October 1721, soon after peace was made with Sweden, he was acclaimed Emperor of All Russia. Some proposed that he take the title Emperor of the East, but he refused. Gavrila Golovkin, the State Chancellor, was the first to add "the Great, Father of His Country, Emperor of All the Russias" to Peter's traditional title Tsar following a speech by the archbishop of Pskov in 1721. Peter's imperial title was recognized by Augustus II of Poland, Frederick William I of Prussia and Frederick I of Sweden, but not by the other European monarchs. In the minds of many, the word emperor connoted superiority or pre-eminence over "mere" kings. Several rulers feared that Peter would claim authority over them, just as the Holy Roman Emperor had once claimed suzerainty over all Christian nations. Peter also reformed the government of the Orthodox Church. The traditional leader of the Church was the Patriarch of Moscow. In 1700, when the office fell vacant, Peter had refused to name a replacement, allowing the Patriarch's Coadjutor (or deputy) to discharge the duties of the office. Twenty-one years later, in 1721, Peter followed the advice of Feofan Prokopovich and erected the Holy Synod, a council of ten clergymen, to take the place of the Patriarch and Coadjutor. In 1722, Peter created a new order of precedence, known as the Table of Ranks. Formerly, precedence had been determined by birth. In order to deprive the Boyars of their high positions, Peter directed that precedence should be determined by merit and service to the Emperor. The Table of Ranks continued to remain in effect until the Russian monarchy was overthrown in 1917. 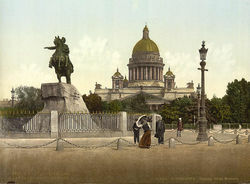 Peter also introduced new taxes to fund improvements in Saint Petersburg. He abolished the land tax and household tax, and replaced them with a capitation. The taxes on land on households were payable only by individuals who owned property or maintained families; the new head taxes, however, were payable by serfs and paupers. In 1724, Peter had his second wife, Catherine, crowned as Empress, although he remained Russia's actual ruler. All of Peter's male children had died—the eldest son, Alexei, had been tortured and killed on Peter's orders in 1718 because he had disobeyed his father and opposed official policies. Alexei's mother Eudoxia had also been punished; she was dragged from her home and tried on false charges of adultery. A similar fate befell Peter's beautiful mistress, Anna Mons, in 1704. In 1725, construction of Peterhof, a palace near St Petersburg, was completed. Peterhof (Dutch for "Peter's Court") was a grand residence, becoming known as the "Russian Versailles" (after the great French Palace of Versailles). 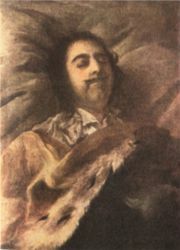 Peter the Great on his deathbed. In the winter of 1723, Peter, whose over all health was never robust, began having problems with his urinary tract and bladder. In the summer of 1724 a team of doctors performed the necessary surgery releasing upwards of four pounds of blocked urine. Peter remained bedridden till late autumn. Then in the first week of October, restless and certain he was cured, Peter began a lengthy inspection tour of various projects. According to tradition, it was in November, while at Lakhta along the Finnish Gulf to inspect some ironworks, that Peter saw a group of soldiers drowning not far from shore and, wading out into near-waist deep water, came to their rescue. This icy water rescue is said to have exacerbated Peter's bladder problems and caused his death on January 28, 1725. The story, however, has been viewed with skepticism by some historians, pointing out that the German chronicler Jacob von Stählin is the only source for the story, and it seems unlikely that no one else would have documented such an act of heroism. This, plus the interval of time between these actions and Peter's death seems to precludes any direct link. However, the story may still, in part, contain some grain of truth. In early January 1725 Peter was struck once again with uremia. Legend has it that before lasping into unconsciousness Peter asked for a paper and pen and scrawled an unfinished note that read: "Leave all to...." and then, exhausted by the effort, asked for his daughter Anna to be summoned..
Peter died between four and five in the morning January 28, 1725. An autopsy revealed his bladder to be infected with gangrene. He was fifty-two years, seven months old when he died, having reigned forty-two years. 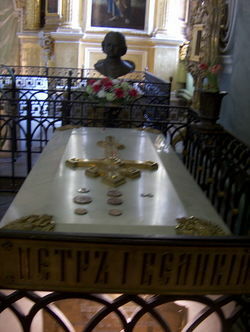 The tomb of Peter the Great in Peter and Paul Fortress. "We could enthuse forever about the greatness of Peter's actions and still not deplict in all its fullness, brilliance and worth everything that he accomplished...But in creating, he destroyed. He caused pain to all in whom he came into contact. He disturbed the safety, peace, prosperity, interests, strength, well-being, rights and dignity of everyone he touched. He made things unpleasant for everyone. He did harm to everyone. He touched intellectual, political, social, financial, family, moral and spiritual interests. Is it possible to love such a statesman? In no way. Such men are hated."